Have you ever wondered how to use the spot removal tool in Lightroom? Although we have covered it in depth in our Workflow and Post-Processing course, I thought it would be a good idea to share some detail about the specifics of the spot removal tool in a video. If you are just starting out in Lightroom, this will be a good introduction on how to use the spot removal tool, which keyboard shortcuts to use to access it and how to do basic customizations to make the tool fit your needs. As you saw, the spot removal tool requires you to choose an area to repair. It then samples a nearby area and either clones it or uses it for reference to heal the selected area. Personally, I always recommend using the heal method, as cloning rarely gives as good of results. You are also able to adjust the feather and opacity of the spot removal, giving you more control over how your final results look. You can access the spot removal tool by locating it underneath the histogram in the develop module or pressing “Q” on your keyboard. As someone who primarily photographs weddings, I find myself using the spot removal tool the most often on people. I use it to remove skin blemishes, crumbs or lint on clothing, or stray hairs. I also tend to use it to remove distracting objects such as branches or trash from my images. 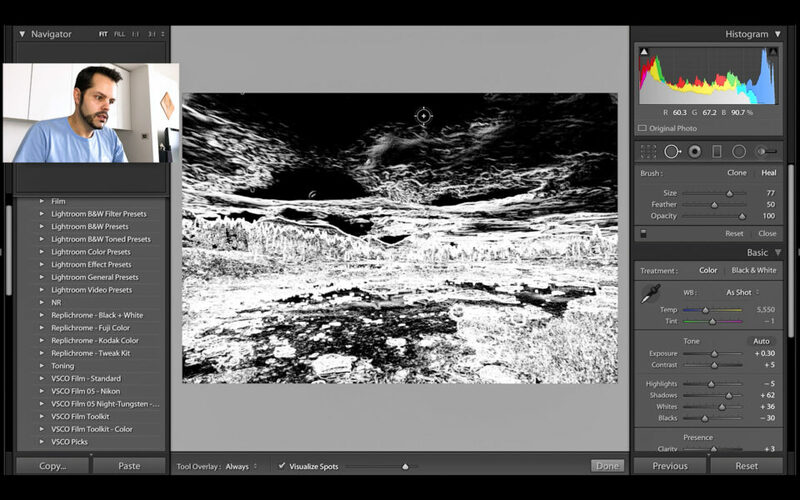 The spot removal tool is also incredibly useful for landscape photographers. It quickly and easily removes sensor dust from images. 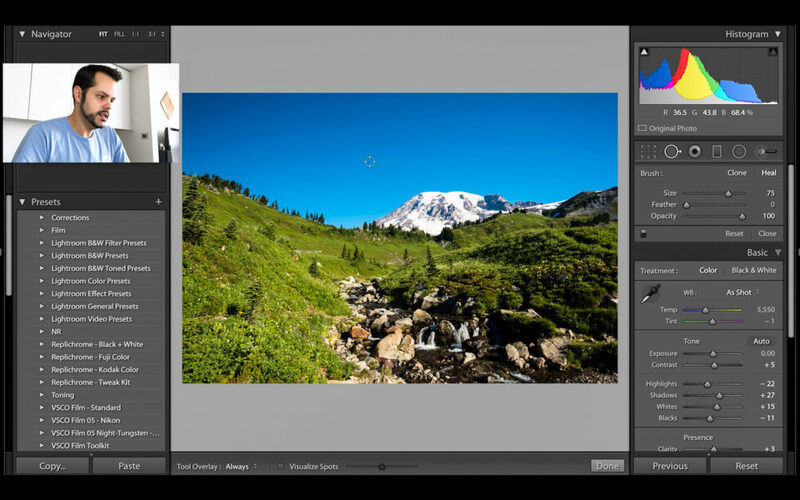 It can also be used to remove simple yet distracting elements of a landscape image. For more complex removal jobs, I’d still suggest using Photoshop. 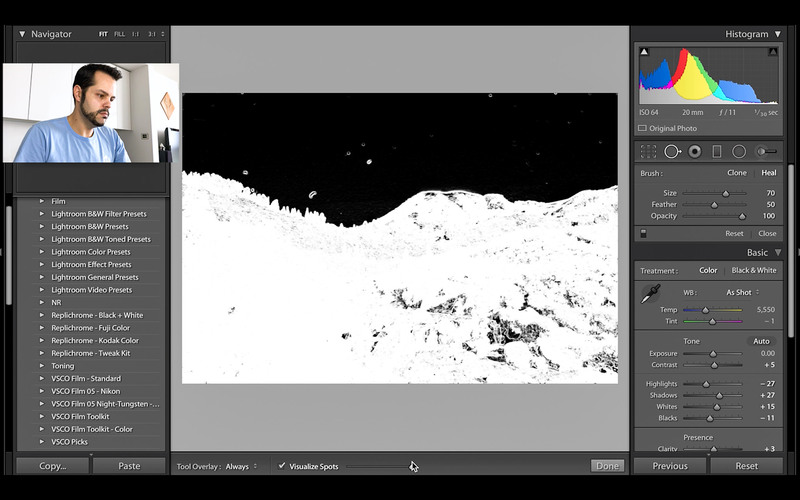 As you can see, by simply checking a box the entire image transforms, allowing you to more easily see sensor dust spots. You can always use the slider to adjust the sensitivity if you don’t initially see any spots. If you see too many spots, try decreasing the sensitivity or zooming in to an area to see how many spots are actually there. Many times, the spot visualization tool will show more spots than are actually in your image. Of course, you should not rely solely on the spot visualization tool to find spots in your images. Many spots can be hidden in objects like clouds. 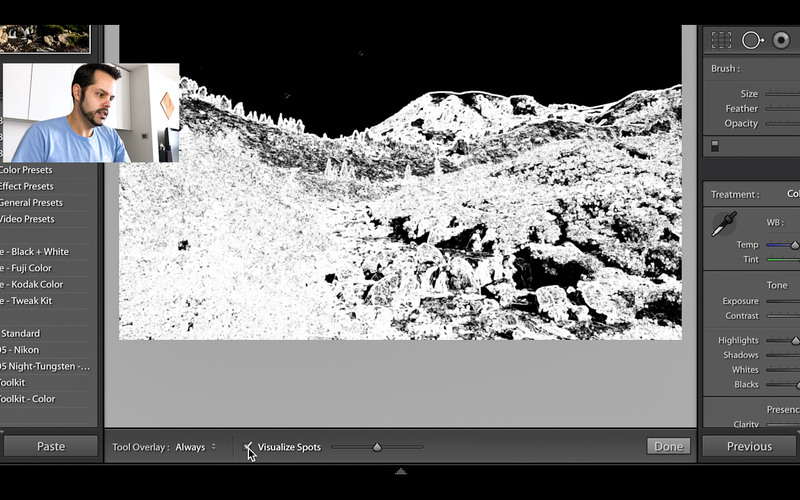 These are very difficult to see with the spot visualization tool, yet easy to see when looking at the normal image. Spot removal works the same regardless of whether you use the spot visualization tool or not. 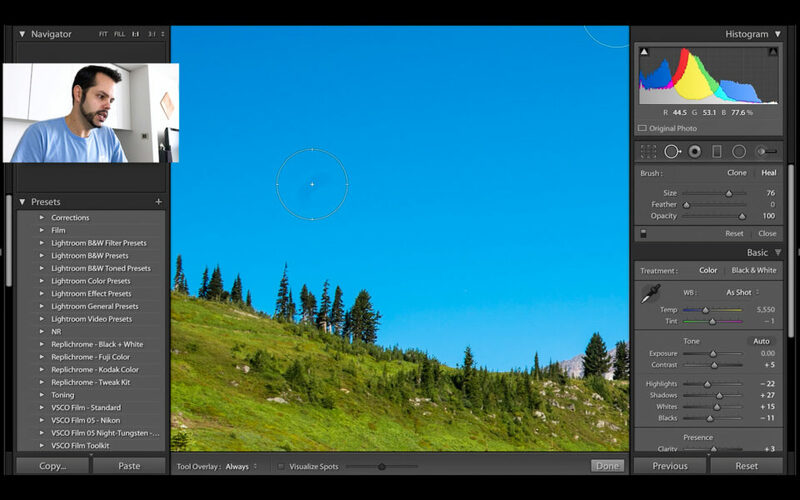 Since Lightroom is a non-destructive post-processing software package, all adjustments to images are added as invisible “layers” and each adjustment is recorded in the history tab. This means that tools like the spot healing tool can slow down your editing when heavily used. Out of all of the different tools in Lightroom, the spot healing tool tends to have the biggest impact on system performance. For that reason, we recommend that you apply spot healing after all other adjustments are made, since it is known to dramatically slow down editing in Lightroom. We hope you have enjoyed our video on how to use the spot removal tool in Lightroom. Please note that Nasim and I are starting new series of YouTube videos that will cover a lot of different topics. I will be starting out with Lightroom basics as I have done above and eventually cover more complex editing, while Nasim is planning to post the process of editing of his images in both Lightroom and Photoshop, which will be much more advanced in comparison. Please let us know if there are any videos you’d like to see us make! If you like this video, please consider subscribing to our YouTube channel now so you’re sure to know when we post something new! Hi Muhammad, just as you can copy one “clean” part of a person’s skin to another remove a blemish, you can also copy a blemish and add it to other parts of an image. This is best done in Photoshop and not Lightroom. You’re welcome! Glad you found it helpful and learned something. I have found that the most difficult of all blemishes and skin imperfections to remove are the ones around the eye, largely because of the fine lines and wrinkles to be found there. Also there are huge variations in skin tones between the eye area and the rest of the face. I tried this once on a picture with dark circles around the eyes and plenty of skin tone variation right below the dark circles, similar to the photo above. I worked with the clone stamp (not in Lightroom) and redid the photo several times before I got anything resembling success. My final result was not bad. I’d like to suggest a video tutorial on this subject. I’d love to learn from an expert. If I had my ‘druthers I’d rather see you work with a clone stamp than a healing brush or other tool, because that is the tool I’m most proficient with, and also because using the clone stamp would be similar on any photo editing program even when demonstrated in Lightroom. I’d have to agree with you that the skin and areas around people’s eyes are some of the most difficult to touch up. I am by no means an expert at retouching. I tend to take a more natural approach to retouching when possible and only do minimal edits. Maybe someone else on the team can help out and do a video or we can include it in our advanced post processing course. Thanks for the suggestion! Well done, John. I have used this tool a bit but I did learn a few new tricks, especially the difference between “clone” and “heal”. Minor quibble: again, I must object to your overuse of the phrase “go ahead”. That phrase implies that you are doing something out of the normal sequence, which you are not here. You are certainly not the only one to do this. I hear it in almost all online instructional videos. Thanks Jim! Glad you learned something new. Thanks for watching! If i want to be sure to not oversee such dust spot and ruin a large format print, i have a little trick (? ): I put the slider for dehaze tool to right. This change of the contrast shows much more spots. Thanks for the suggestion! It sounds like a good idea to me. Unfortunately, I can’t test it out since I don’t use LR CC. The standalone version doesn’t have the dehaze tool yet. Maybe some other people can try it out and chime in with their experience? Thank you for this tutorial. Very useful. You say that Photoshop does this sort of thing better/easier. 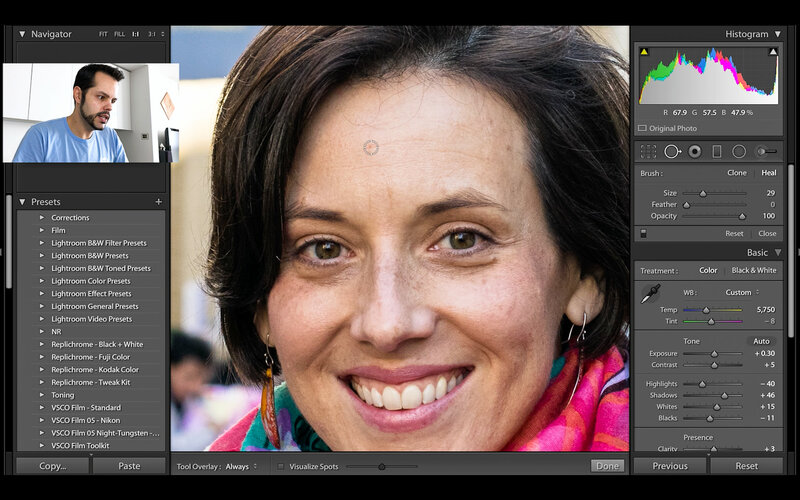 Do you have a corresponding tutorial for spot removal in Photoshop? Hi John, glad to hear you enjoyed it! We have an example of it in our full post processing video, but you’d have to buy it to see it. Maybe we can pull that clip and publish it, as it’s a great example of how differently the tools work. If you do pull that section and publish it, I would be grateful. Sorry to be cheap, no money at the moment. I wish you great success with the video in any case. Thank you very much John for your very clear videos. You are very welcome, Jorge! Hi, I can’t see the “visualize spots” on my LR. I am running LR4 – does it have this feature? Jacki, I believe this feature only became available with Lightroom 5.